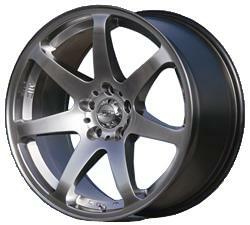 JIC is proud to announce the second wheel to the JIC line up, the J Force 07 high performance wheel. Proudly made in Japan with the highest quality control, the J Force 07 features a clean 7 spoke design, high quality finish, high pad clearance for big brake applications, and staggered wheel widths for high performance vehicle. The J Force 07 wheel also includes a JIC emblem and JIC centercap to show that your vehicle is equipped with a genuine JIC product. Valve stem and cap are also included with each wheel. Please specify offset, bolt pattern, and desired width before order. Please double check your vehicle fitment before ordering. More offsets and bolt patterns to come.